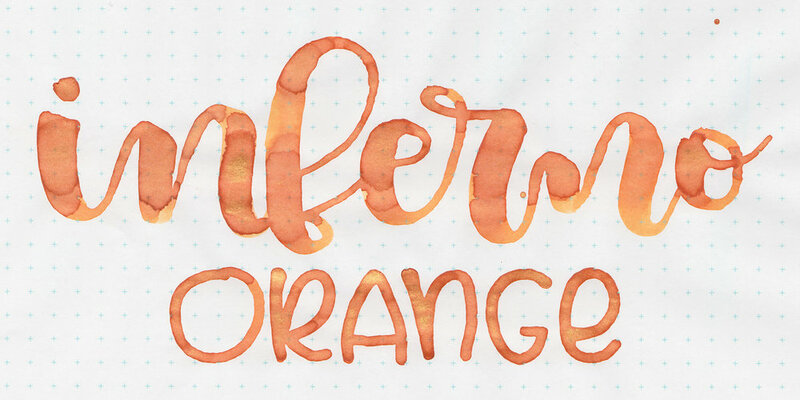 Today's ink is Diamine Inferno Orange, from the Diamine Shimmertastic 2016 collection. I purchased my sample of ink from Vanness Pens. 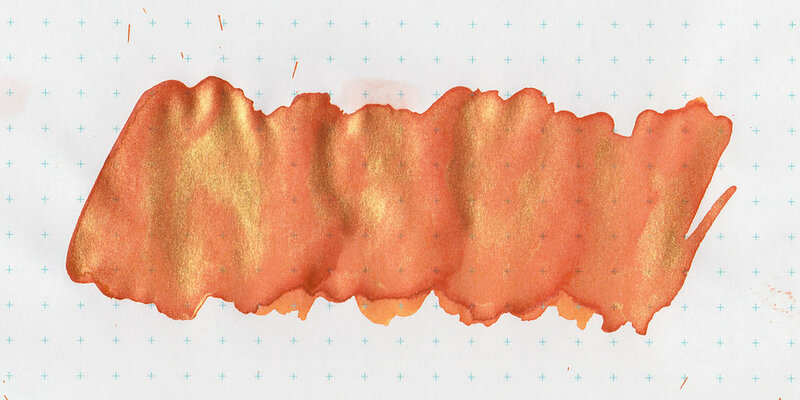 Inferno Orange is a bright orange with gold sheen. Seasonally, I would use this ink in the summer. There is a ton of shimmer in the large swabs. Since this is a shimmer ink, I rotated my pen before writing each time. Bleeding: Low-only in the flex nib and swab on TR and Leuchtturm. I used Step Forward Paper (21 lb) copy paper, and the ink did great-no problems. The paper did pucker just a little bit around the swab. Ink swabs for comparison, left to right (top to bottom for mobile RSS): Nemosine Solar Storm 1859, Diamine Inferno Orange, and Robert Oster Orange. Click here to see the Diamine inks together. Montblanc Lucky Orange, Diamine Orange, and Sailor Jentle Apricot. Click here to see the orange inks together. I used a Pelikan m400 with a vintage 400N nib on Tomoe River paper. The ink felt just a touch dry in the flex nib. Overall, the ink is pretty well behaved, it does have some bleeding in the flex nib. I don't love the ink enough to need a full bottle, but it was fun to play with a sample.